Statue commemorates the Clydesdale working horse and the centenary of the Angaston Agricultural Bureau. 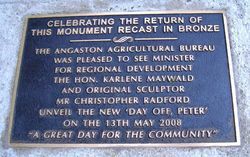 The sculpture was restored and unveiled on the 13th May 2008 and coincided with the 120th anniversary of the Angaston Agricultural Bureau, the oldest Bureau branch in Australia. 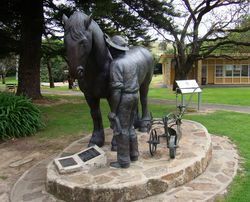 Exactly when the first importations of heavy horses into Australia were made is not clear, however, in the early days of pioneer settlement of New South Wales, pioneers attempted to bring horses for draught purposes to Australia despite the difficult transport conditions. In Tasmania, the English dray horse appears to have predominated. 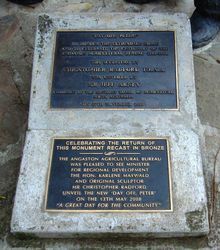 Victoria, in its early days of settlement, secured its foundation in draught stock mainly from Tasmania and New South Wales, to be later followed by importations from England and Scotland. English horses were also introduced into Western Australia late in the 1830’s and some were also imported to South Australia. "Day Off, Peter ! " 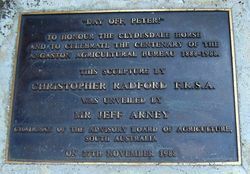 To honour the Clydesdale horse and to celebrate the centenary of the Angaston Agricultural Bureau 1888 - 1988.